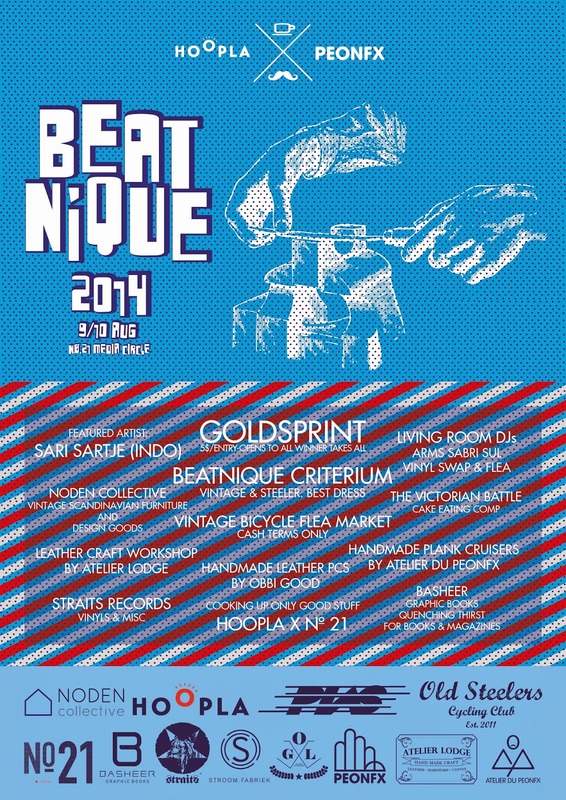 Hoopla x Peonfx presents you Beatnique 2014. A 2 day event happening over at Hoopla cafe this national day weekend. Infusing crafts, music and passion all into one. A selection of brands and their finest products will be available. From handmade leather crafts, photography, artwork, vinyl tunes, kendama to bicycle enthusiasts. If you have noticed the artwork in Hoopla, yes, we are bringing you Sari Sartje's Stroom Fabriek (Indonesia) as our featured artist in our inaugural event. Highlights would include vinyl and bike swap, Beatnique Goldsprints and Criterium where registration fees applies. Cash to be won and for the Criterium, PIAS Agra frameset as top prize. For the gastronomically brave, take part in the cake eating competition and winner takes all - cash in hand and cake in the tummy. If you are into leather crafts, the folks from Atelier Lodge will be having their leather workshop in Hoopla as well. Where: Nø 21 Media Circle, S138562 - Not sure? Google it! - vinyl swap among enthusiasts. - Open qualifiers, fixed distance. - Top 2 best timings will be in the finals. KENDAMA JAM! 9&10 August. All are welcome!! - Cakes, Tarts and mind blowing brownies. - Sales of vinyls and all things music. - Printed Artwork available - postcard and posters. - Leather craft workshops. Contact us for more details. - Ready made leather products will be available.